The Magnificent Jewels sale on Nov. 29 at Christie’s Hong Kong will lead with a stunning 10.05 ct. Burmese pigeon’s-blood ruby ring. 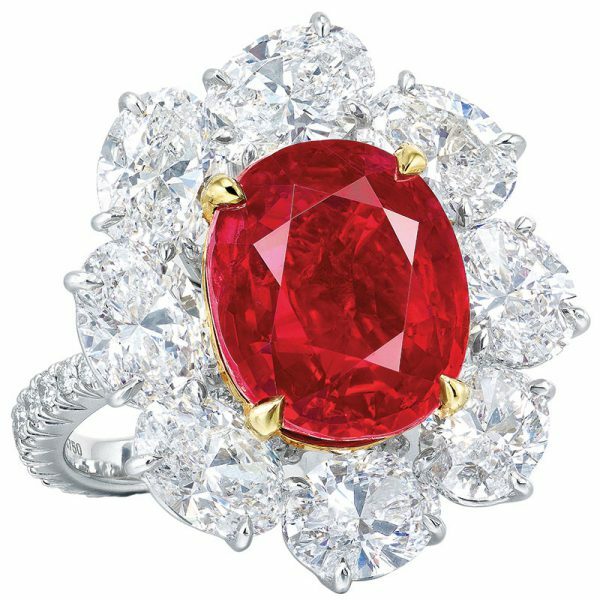 The ring, designed by Faidee, is called the Ratnaraj Ruby (above); Ratnaraj means “king of precious stones” in ancient Sanskrit. “Only those rubies of exceptional saturation and natural red fluorescence can be deemed as pigeon’s-blood, and it is particularly rare of a ruby of this quality to appear in over 5 carats,” said Christie’s. The ring is estimated at $8.8 million–$12.5 million. A royal bounty indeed. It started in 1997 as a jewelry company created by two stay-at-home moms. A decade later, Silpada Designs was a $200 million business. But the brand never regained its footing after an ill-fated 2010 acquisition by Avon, and it folded earlier this year. In October, the Berkshire Hathaway–owned Richline Group acquired its intellectual property, aiming to revive Silpada with a focus on sterling silver. Whether Silpada’s old home-sales strategy will continue is unclear; Richline chief marketing officer Mark Hanna expects to focus on online and possibly B2B. The big winners at the Sept. 18 Emmy Awards? The People v. O.J. Simpson, Game of Thrones, and earrings. Sofia Vergara turned to her pal Lorraine Schwartz for icicle-style diamond dusters (plus a serpentine-style diamond hand jewel); Tina Fey stunned in Schwartz’s 100 ct. emerald teardrops; The Americans’ Keri Russell wowed in yellow gold and milky quartz chandeliers by Fernando Jorge; Tracee Ellis Ross (Blackish) wore massive de Grisogono pinwheel-style hoops studded with diamonds and emeralds; Orphan Black winner Tatiana Maslany donned slim Forevermark diamond danglers; Shameless star Emmy Rossum threw it back in 1920s pearl and diamond earrings from Fred Leighton. There was hardly a bare lobe on the red carpet—a trend we’re hoping continues through the Golden Globes, Oscars, and beyond. It turns out Apple won’t challenge Rolex after all. After only a year and a half, the House That Jobs Built is no longer offering its 18k gold Apple Watch Edition. When the $10,000–$17,000 timepiece was first introduced, many thought it portended a brave new world of high-end high-tech; the gadget giant even developed a proprietary, supposedly extra-hard, gold alloy. Apple didn’t give any reason for the change; it simply removed the watch from its site. Still, no one should cry for Apple; according to its figures, it’s now the No. 2 watch brand in the world—behind, that’s right, Rolex. Earlier this year, GIA intercepted an undisclosed synthetic diamond at its Hong Kong lab. And while that has happened a little too often, GIA called this particular undisclosed synthetic a “significant milestone.” It was more than 5 cts., J and VS (equivalent grades), and grown by chemical vapor deposition. (Until now, most big stones were produced by HPHT.) “Black inclusions, often contained in synthetic diamond, were not found in this CVD specimen,” the lab wrote. “It could have been mistakenly identified as natural, based on microscopic examination alone.” Even more troubling are the results from GIA’s new melee screening service: In one parcel of 3,500 melee, three turned out to be detected lab-growns. On Oct. 3, at around 2 a.m., five robbers burst into Kim Kardashian West’s hotel room in Paris, pulled her from her bed, and tied her to a chair while they pocketed an estimated $10 million in jewelry. French police say the criminals, who at press time were still at large, were able to rob the world’s highest-profile celebrity by tracking her movements on social media. West’s Instagram feed detailed the bling she had with her, including a Dolly Cohen diamond grill and a 20 ct. diamond ring by Lorraine Schwartz valued at roughly $4 million. Fashion insiders were quick to blame the robbery on the reality star’s propensity for flaunting her many luxuries online. For spring 2017’s top 10 shades, the Pantone Color Institute took a bit of inspiration from an unusual source—the kitchen. Among the edible selections: Hazelnut and Kale. The seasonal color choices, said Pantone’s executive director Leatrice Eiseman, are “reminiscent of the hues that surround us in nature”—Primrose Yellow, Flame, and Greenery among them—and “evoke a spectrum of emotion and feeling.” Perhaps that explains our sudden desire to escape to a blissful sun-soaked Island Paradise. It’s been a tough few years for the jewelry sector, but through it all, Signet Jewelers was posting consistently rising sales. That is, until Aug. 25, when America’s largest jeweler announced its comps had dropped 2.3 percent, the first fall in six years. Worse, the company expects the comp declines to continue through Christmas. CEO Mark Light told analysts he wasn’t sure if a recent spate of stone-switching allegations at flagship chain Kay Jewelers hurt sales (Kay’s comps held on better than most of its other brands). He instead blamed the “consumer mindset,” due in part to the “unusual” presidential election. Consumer confidence registered a dramatic fall in October, as measured by the Conference Board, with shoppers expressing concerns about the job market and their short-term prospects. Still, the decline followed three months of gains—and most felt that the economy will continue to expand in the short term.